Budding scientists will compete for $1.8 million in awards including top prize of $250,000. WASHINGTON, DC, January 24, 2019 – The year has just begun and already Indian American whiz kids are in the news for their sharp intellect and brilliant mind. In an eagerly-awaited announcement Wednesday afternoon, it was revealed that 17 Indian-origin high school students are among the 40 finalists in the highly-acclaimed Regeneron Science Talent Search (Regeneron STS) which equates to 42.5 percent of the contestants. It is a staggering figure when one considers that Indian Americans as a whole comprise about one percent of the US population. Earlier this month, 300 scholars were selected from a pool of nearly 2,000 applicants, and each semi-finalist was awarded $2,000 in addition to their school receiving a grant of an equivalent amount. 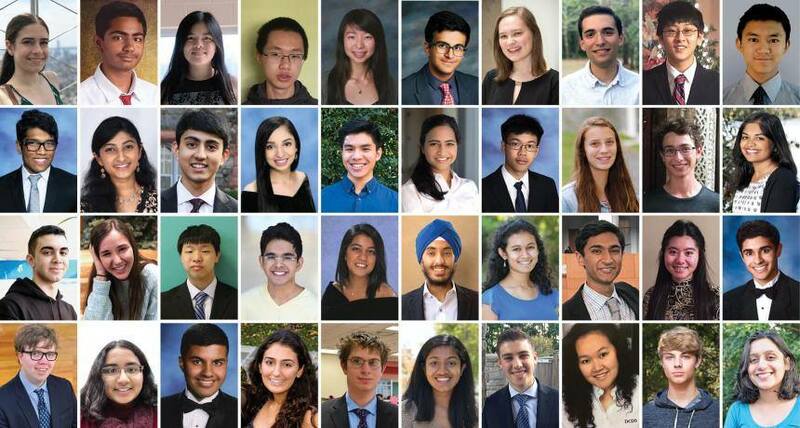 Of these ‘Top Scholars’, 40 finalists who will receive a minimum award of $25,000 were then named and they include a large number of Indian-American teens: Ayush Alag, The Harker School, San Jose, CA; Anjali Chadha, duPont Manual Magnet High School, Louisville, KY; Navami Jain, North Carolina School of Science and Mathematics, Durham, NC; Aayush Karan, University School of Milwaukee, Milwaukee, WI; Ananya Karthik, St. Francis High School, Mountain View, CA; Preeti Krishnamani, Charter School of Wilmington, Wilmington, DE; Chirag Kumar, Horace Greely High School, Chappaqua, NY; Varun Kumar, Bergen County Academies, Hackensack, NJ; Eish Maheshwari, Herricks High School, New Hyde Park, NY; Sai Mamidala, Garnet Valley High School, Glen Mills, PA; Natasha Maniar, The Harker School, San Jose; Ronak Roy, Canyon Crest Academy, San Diego, CA; Eshika Saxena, Interlake High School, Bellevue, WA; Ruhi Sayana, The Harker School, San Jose; Aditi Singh, Horace Greeley High School, Chappaqua, NY; Amol Singh, Lynbrook High School, San Jose, CA; and Madhav Subramanian, Jericho Senior High School, Jericho, NY. “I’m really excited to have some cool conversations, to meet other really engaging people,” finalist Chirag Kumar gushed in a video posted by the competition’s organizer, Society for Science & the Public, on Twitter. “I’m so impressed by the hard work and brilliant thinking these 40 exceptional students have demonstrated in their research projects. I look forward to meeting them in DC, and I am excited to see how their passion for science will impact our world,” she said.